Never fear however, in the same article, Governor Rick Snyder defends his Granholm legacy (Steudle, I mean) lauding the director for national recognition, acting skills, showing up for work, etc. And even another Michigan bureaucrat had nice words. In other news, MDoT spokesman Jeff Cranson is reportedly keeping his job for now. 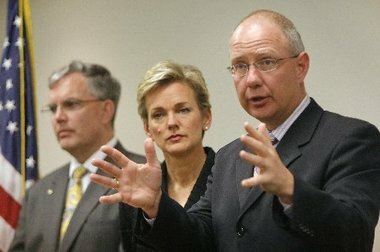 A resolution to declare the Michigan Department of Transportation Director Kirk Steudle unfit to lead the department and express our lack of confidence in his leadership. Whereas, In 2010 MDOT spent $9.5 million on a landscaping project along I-696 between I-75 and I-94 in Macomb and Oakland counties. Two years later, there was a die-off of plantings over large stretches of the area due to erosion, partly caused by mowing, which leached eroded soils into the storm drainage system. Whereas, The Federal Highway Administration has endorsed the employment of an Equal Employment Opportunity Officer within state transportation agencies as a best practice. The MDOT civil rights compliance officer has not been supported by Director Steudle, and has accused him of bullying, diverting work from her office, and a lack of leadership in the areas of equal rights and workplace discrimination; and Whereas, His lack of sensitivity to staff issues and his mismanagement of scarce state funds in the face of the current road funding deficit are unacceptable and demonstrate a failure to properly administer the office and responsibilities of Director of the Michigan Department of Transportation; now, therefore, be it Resolved by the House of Representatives, That we declare the Michigan Department of Transportation Director Kirk Steudle unfit to lead the department and express our lack of confidence in his leadership; and be it further Resolved, That copies of this resolution be transmitted to the Governor of Michigan. For more or less of the above and more? One note that I need to add to this. This weekend after the Michigan Senate was confidently patting itself on the back for clearing out useless bills from the hopper, the Yankee Air Force Museum held a event to get the most "Rosie the Riveters" together in one place for a promotion of their new Willow Run Museum which was where the Liberator was built in the largest numbers. Guess who (and her 37 other colleagues) didn't? Not sure, however, we have photographic proof of the leading cause of Erectile Dysfunction.